why are these 50 bucks each if they don't even come with any accessories??? for that price Spikor should of got a alternate arm and a weapon at least! Please go back through this thread and read it. It has been explained multiple times already. I don't think I'll go for Spikor or Chopper, but I'll definitely get the Trollans. In regards to accessories, totally understand they can't afford them. No flying stands for the Trollans is a bummer. Wish I'd bought a couple of spare Orko's now! Who said no flying stands for the trollans Where did you read this? Montork & Dree-Elle just lost some extra accessories they were originally planned to come with that's all. Last edited by mjw41; April 17, 2018 at 07:40am. "In addition to what you see here, Uncle Montork and Dree Elle are planned to come with "floating" display stands." It is written directly below the photo of the figures when you go to order them. Good news about the flight stands, though I'm disappointed that it seems Spikor won't come with his alternate hand. Surely it's something that would have been mentioned? That's awesome that they will include them! When people mentioned no accessories I assumed that included flying stands. The GI Joe club asks to pay $25 for basically a new head. $50 for a one-time toy you'll never see again for a niche market is honestly a bargain. Hopefully any "missing" weapons can come with a Man-E-Faces type offering in the future. These 2 really didn't have any weapons as it is so I personally get the decision. So, I was already planning to attend the show this year - but the reveal of the Mythic Legions exclusives (hopefully) being available for purchase at the show definitely sweetens the pot. I love the Cringer inspired green cat man alot. The elfin Evil Lyn is pretty cool too. I bought tickets last year and circumstances forced me to miss it - super stoked to finally get to go this year. I won’t be attending but the exclusives do look cool. Wish I could! 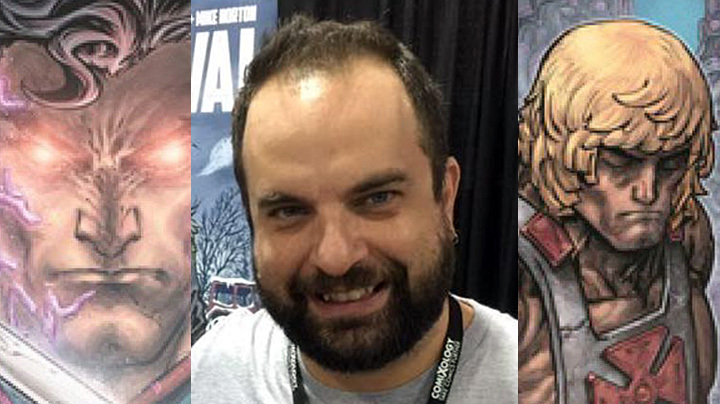 Tim Seeley, writer on the upcoming Injustice VS. He-Man and The Master of The Universe miniseries from DC Comics, will be attending Power-Con this August 25 & 26 in Torrance, California! Tickets and exclusive are on sale now. That's really cool. Maybe he can talk about some future story ideas he has for He-Man and She-Ra comics. Awesome news that Tim will be at Power Con !!!! We will have the chance to know more about the future of the MOTU comics! Hey Val just wondering if bbts has made their figure order yet? Not yet. If they offer it for pre-order, it'll be after the Power-Con pre-order has ended. Hey, so I placed a non-attendee order for the three figures a couple days ago, but I haven't received any sort of email confirmation yet. And I haven't been able to see the charge show up on my credit card. Should I be expecting a confirmation? Yes it should have gone through on your card immediately and you would've gotten a mail within minutes of paying. I'd suggest you ask Val to check on his side. I meant to post on here some time ago that I ordered my figures as Non Attendee. It was very easy. I can't wait to get the figures, and to all of you attending Power Con, I hope you have a great time! I actually got 2 of the Dree Elle and Montork figure sets. I can't believe we are actually getting toys of these 2 after all these years. Now......to go and pre order STRIDOR!! I know! It's nice to get something fun and fan demanded rather than some boring repaints. Val you’re hiding something! Those teaser images definitely included shots of a Filmation Two Bad didn’t they!!? ?